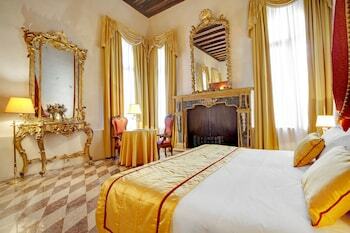 With a stay at Hotel Dona Palace in Venice (San Marco), you'll be steps from St. Mark's Basilica and St Mark's Campanile. Featured amenities include dry cleaning/laundry services, a 24-hour front desk, and multilingual staff. A stay at B&B La Casa di Miele places you in the heart of Marcignago, and within a 15-minute drive of Certosa di Pavia. The front desk is staffed during limited hours. Located in Grottammare, La Torretta sul Borgo is within a 15-minute drive of Cupra Marittima Beach and Palazzina Azzurra. When you stay at Agriturismo Cornolade in Ponte nelle Alpi, you'll be in the mountains and steps from Lake Santa Croce. Free self parking is available onsite. Located in Badia, Rosa Alpina Hotel & Spa is within a 15-minute drive of Boe Cable Car and Adventure Park Colfosco. Free self parking is available onsite.